Ideal for a variety of cutting jobs the tanto from Cold Steel. This Knife has a top end design and well though out materials to ensure it can keep performing at a high quality no matter what environments/conditions you are in. The most notable feature of this knife is the blade shape. The Tanto shape is very efficient at penetrating tough materials whilst the 6" blade offer a good reach and deep penetration. The Blade has been forged from High-Carbon - U.S. CPM 3-V. This metal is extremely tough and known for it's high corrosion resistance. The blade has then had a DLC (Diamond Like Coating) which gives it the high quality glossy finish and helps protect the blade from scratches and general wear. Built with user in mind Cold Steel have picked the best material and design for the handle to ensure maximum user comfort and control. Kraton is a rubber like material and has been used for this handle. This material is comfortable and has deep texturing for optimal grip and control helping increase the quality of the job and reduces the risk of you cutting yourself. 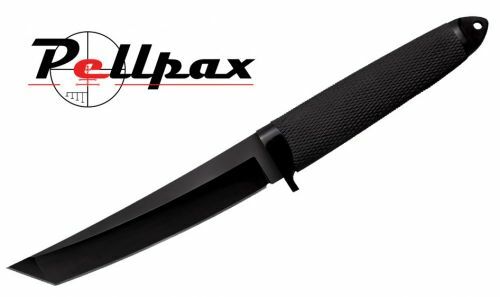 To help both transport your knife and protect it when not in use the Cold Steel 3V Fixed blade knife comes with a Secure-Ex sheath. This sheath is very durable helping protect your blade from impacts and wear. Add this item to your basket & spend an extra £209.01 to apply for finance.